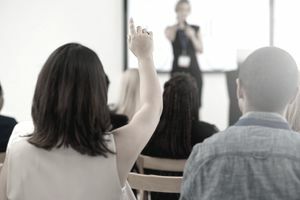 Results, measurement, return on investment, testing, behavioral change, performance improvement, expectations, accountability, and learning applied on the job are this century's language of education, employee training, and performance development. Successful performance technologists, managers, consultants, and training professionals provide a real-time connection between the classroom and the workplace. If not, why provide training at all? In my earlier articles, I gave concrete suggestions for training transfer to the workplace. These suggestions focused on actions and best practices that should take place before and during the employee training session to promote the transfer of learning to the job. Equally important to training transfer are the activities that start during and occur following the employee training session. You can help create an environment that fosters the ability of each employee to assimilate learning and apply employee training on the job. Just follow these four guidelines. You can help employees apply training on the job. Your second mission is to continue to assess the effectiveness of the employee training over time. Determine whether the trainees feel able to apply the training on the job. Talk about specific behavioral changes, ways to apply the training, and different approaches to try as a result of the training. Share evaluation data from the employee training session, and consider ways to improve the employee training session. For this longer-term evaluation, you will want to use a written tool as well as ongoing discussion. You will want to meet with the trainee and the supervisor several additional times over the three to six months following the employee training. Meet with each trainee, their supervisor, and possibly, their coworkers, following the employee training session. The purpose of the meeting is to assess the difficulties the training participant will experience in applying the training on the job. You want to help the supervisor, especially if she did not attend the training, understand the results she can anticipate from the employee training. You also want to help the participants discuss work environment changes that will enable training application. Because you also met with the supervisor prior to the training, this is part of an ongoing discussion. Remind the supervisor, particularly, or coworker that one of the most powerful methods for helping others apply training in the workplace is to act as a role model using the training or skill. Coworkers can offer suggestions, when requested, about applying the employee training. The supervisor is expected to assist with the application of the employee training. It presumes the supervisor is either skilled in the training content or he attended the employee training. Another powerful approach to training application involves an entire workgroup, including the supervisor, learning and then practicing the employee training content together. In a mid-sized manufacturing company, a group of managers, supervisors, and quality professionals attended the same customized employee training sessions for several hours a week. A central component of each employee training session was a facilitated discussion about the application of the concepts learned the prior week. Follow up with the trainees and their supervisor about progress on the goals and action plans they developed during the employee training. "There are several transfer strategies outlined in the literature which can be incorporated into training courses, and research has produced some encouraging results. "In particular, when learners are given goal setting and self-management instruction as part of a training course, they demonstrate a significantly higher level of transfer (eg., Gist, Bavetta, & Stevens, 1990a; 1990b). "Such strategies increase the likelihood of transfer because they acknowledge the impact of organizational system factors while at the same time assisting the individual to focus on potential applications and to 'make plans' for using the training. "Both designers of instruction as well as those delivering it have a responsibility to address the transfer issue - to help learners think through how to integrate the skills into their jobs and to plan in terms of what will facilitate or inhibit the transfer. It is no longer good enough to leave it up to the individual learner - if it ever was." Help facilitate a partnership between the supervisor and the individual who attended training. They need to meet periodically so the trainee can share his application plan and progress with the supervisor. This partnership also consists of praise, positive reinforcement, and rewards for learning and applying the employee training. This partnership ensures that failed attempts to apply new learning are viewed as learning opportunities instead of failures. Never “punish” an individual for attempting to practice a new behavior or approach. If your organization approaches performance reviews in a traditional manner, the system or instrument cannot grade him or her down for practicing a new skill.